Physiotherapy uses a range of treatment techniques to restore movement and function to the body, affected by injuries of musculo-skeletal system; sprains, strains, back and neck pain, illness or disability. A Physiotherapy program is planned on individual basis including exercise, individual therapy, massage , ultrasound and electrotherapy. 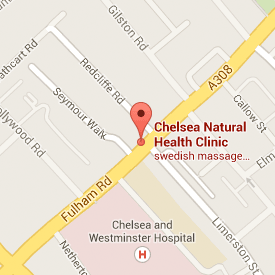 Daniela Karanesheva is at Chelsea Natural Health on Sundays and would be happy to discuss your physiotherapy needs with you. She treats problems like headaches, neck pain, back and shoulder pain, arthritis, spondylosis, bursitis, golfer’s elbow, tennis elbow and sports injuries using techniques such as manipulation, soft tissue and deep tissue massage, ultrasound, electrotherapy and magnetotherapy. Home visits are available on request. Please feel free to contact her using the form and she will contact you to discuss your needs.